Yesterday we had the pleasure of meeting new friends and touring wildlife-friendly, private home gardens in South Jersey, sponsored by Citizens United to Protect the Maurice River. Our Cumberland County tour of private wildlife gardens began in the parking lot at the base of the Maurice River Bridge. Tall marsh grasses lined the river. The shining bright sun felt hot. When we arrived, our tour guide, Pat Sutton, was there to greet us. Being an experienced naturalist and wildlife garden educator, Pat provided the group information on Gardening for Pollinators. 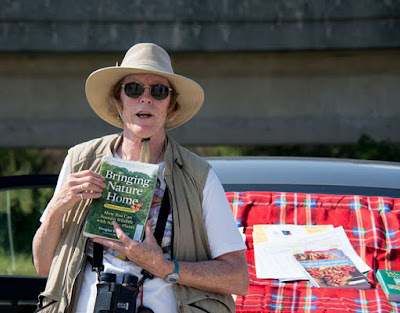 She also gave us an informative itinerary with directions and information written by each gardener about their wildlife garden habitats. Harry and I arrived early, giving us time to meet Pat and browse through a few select gardening books. 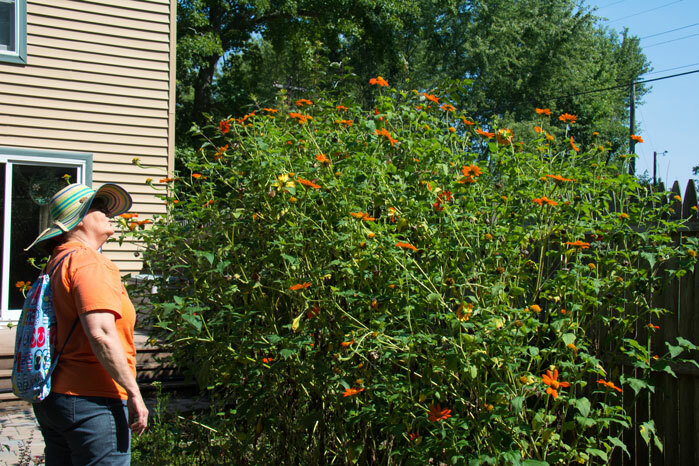 The eager group of about 25 Master Gardeners and garden enthusiasts carpooled to each garden. 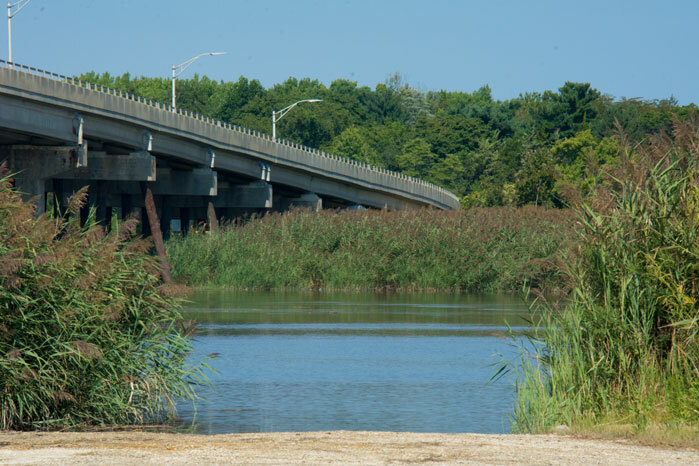 First we traveled to Leesburg then on to Port Norris and Bridgeton, ending at a breath-taking riverside garden in Millville, NJ. 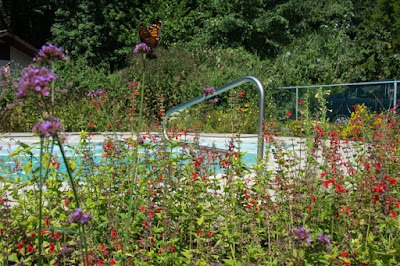 At Janet's garden in Leesburg, hummingbirds and butterflies were everywhere. 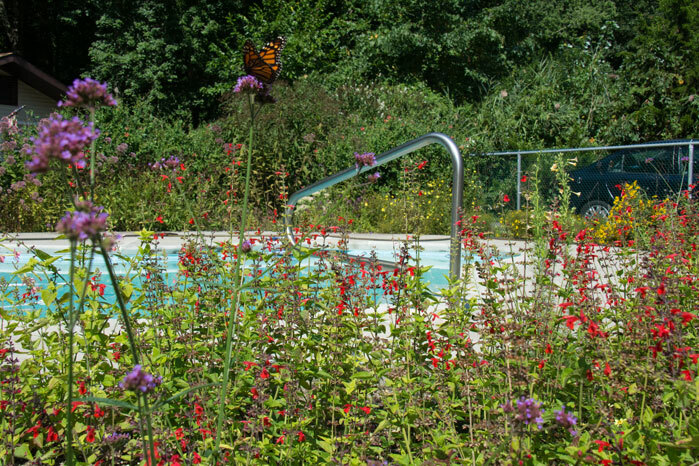 Surrounding her pool, instead of grass, were garden walks bordered by flowers that included masses of red salvias - more than any of the other gardens we visited. No wonder she gets so many hummingbirds! Other blooms included: Tropical Milkweed, Agastache, Coral Honeysuckle, Joe Pye weed, Echinacea, Rudbeckia tribola and Verbena bonariensis. 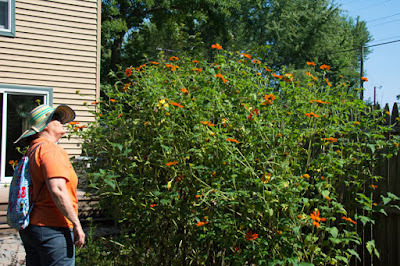 In early spring, she scattered 4+ large packets of mixed zinnia seeds that grew into a beautiful patch of colorful flowers that attract many pollinators. Along the fence was another butterfly magnet: bright orange Mexican sunflowers (Tithonia rotundifolia) growing over 5-feet tall. An easy-to-grow annual that you can start from seeds as early as February, according to Janet. We only have one Tithonia growing in our garden, thanks to a gardening friend (thanks Linda!!). Seeds can be harvested and saved for next year. 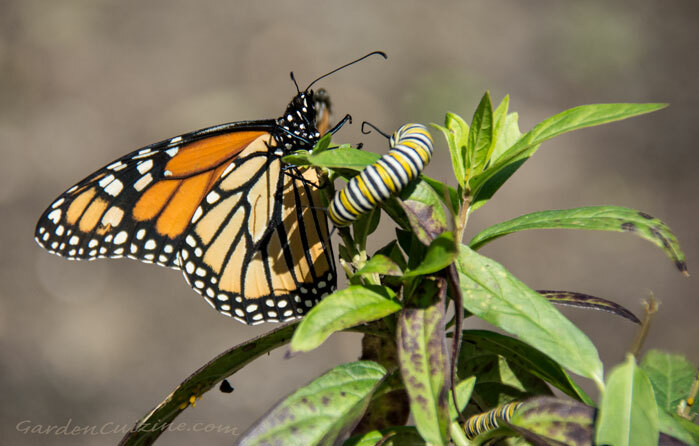 In a garden bed near a rain barrel against the house many hungry monarch butterfly caterpillars were devouring the foliage of milkweed, the only plant they can eat. We also let milkweed grow wild in our yard just for monarchs. 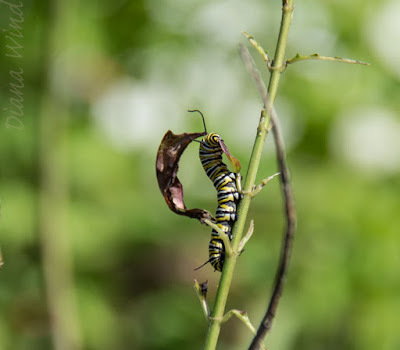 We had a hard time pulling ourselves away from every garden, so much so that we ran over our time schedule and missed PEEK Preserve, Natural Lands Trust garden. Seriously, we could have spent an entire day at each location. 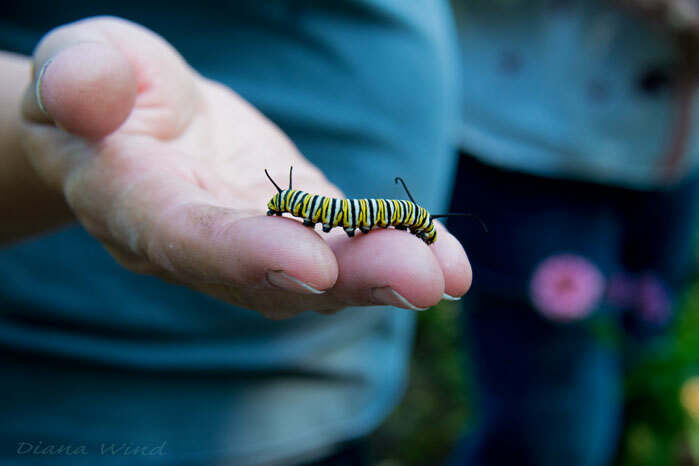 We visited 6 gardens, all focused on gardening for pollinators and NOT using pesticides. We've done garden seed swaps in the past, but never a tour of more than one garden at a time. My head is still spinning with all the new garden ideas and contact information! Special thanks to Pat, CU, and all the gardening hosts and hostesses who shared their gardens and expertise with us. I'll be making a few continuing blog posts about more NJ wildlife gardens; including, Barn Studio of Art. Check back for added photos and related posts. Blog post and photos Copyright (C) Wind. All rights reserved.